I have 71 items in my vault. 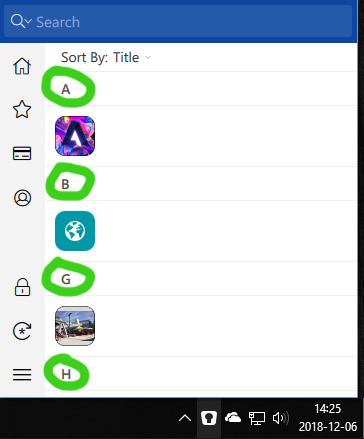 I don´t know how the pop-up window i get when i click the icon on the Task Bar is supposed to work, but i can only find 10 items if i scroll and they seems to be randomly placed there if i filter them by Title. The random displaying is the issue here. Note the jump from B to G as well. I have items under C and D as well if i open Enpass but none of them are displayed. Yes, if i search in that dialog i can find any of the 71 items, but why pick out items randomly if i sort by Title in this dialog?